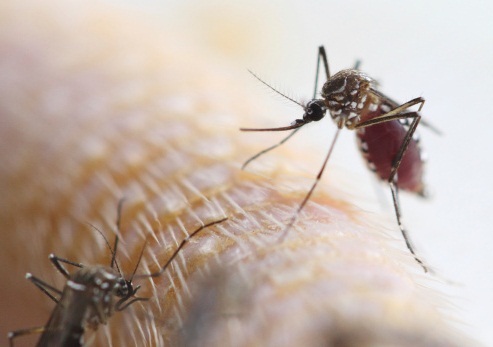 Yellow fever is a viral infection caused by the Aedes aegypti mosquito, which breeds in natural spaces such as tree holes and artificial water containers in the vicinity of humans in sub-Saharan Africa and tropical South America. The Aedes aegypti mosquito is a small, dark mosquito with white lyre markings and banded legs. Yellow fever can be mild or severe. Severe yellow fever can result in serious liver, heart, or kidney problems or bleeding (hemorrhaging). Up to 50% of those suffering from severe yellow fever die from the virus. The virus is spread via one particular type of mosquito in Africa and Central America called the Aedes aegypti. These mosquitoes primarily bite humans but have also been shown to transfer the virus back and forth between humans and monkeys. Living in or traveling to an area where the Aedes aegypti mosquito lives puts an individual at risk for contracting the virus. Be aware that yellow fever endemic locations may not be adequately represented because some entire populations are vaccinated or because accurate reports have not been filed. Anyone can be infected, but older adults are at a higher risk. Yellow fever has three stages. Symptoms of yellow fever have an incubation period of approximately 4-7 days; after this time, the virus will progress into the acute phase (stage 1). In stage 2 of yellow fever, most symptoms resolve and individuals recover. Fifteen percent of individuals with yellow fever will progress to stage 3 within 24 hours. Detection of yellow fever can be difficult because it can be easily confused in its early stage with other conditions associated with travel, including malaria, typhoid, dengue fever, and other viral hemorrhagic fevers. To diagnose yellow fever, a doctor asks questions about an individual’s medical and travel history and collects blood samples for testing. Some of the blood test abnormalities that a doctor will look for include a low white blood cell count, low platelet count, elevated liver function tests, abnormally prolonged clotting times, abnormal kidney function tests, and elevated urinary protein and urobilinogen. A laboratory diagnosis requires specific blood tests which may reveal the virus. If the test does not detect the enzyme-linked immunosorben assay (ELISA) and polymerase chain reaction (PCR), can also detect antigens and antibodies specific to the virus. Results for these blood tests may take several days; therefore, it is crucial to seek immediate medical assistance if you or someone you know is experiencing symptoms of yellow fever. A yellow fever vaccine that lasts for 10 years is available. It is ideal to schedule your vaccination about 4-6 weeks prior to traveling to a location where yellow fever is known to occur. In the event that you are traveling to one of these areas on short notice, contact your doctor about the yellow fever vaccine anyway. The yellow fever vaccine is currently available at yellow fever vaccination clinics in the U.S., often by appointment only. After your vaccination, you will be given a Yellow Fever International Certificate of Vaccination, also known as a yellow card. Your proof of vaccination becomes valid10 days after the vaccine is received, and it is valid for 10 years. Some countries will not admit travelers without this certificate. A single dose of the yellow fever vaccination provides 10 years of coverage. After 10 years, a booster vaccination will be necessary to protect against yellow fever. Always seek immediate medical assistance if you have traveled to a region where yellow fever occurs and develop any of the symptoms of the virus. There are no antiviral treatments for yellow fever. Some people who contract yellow fever may require a plasma transfusion to improve clotting factors and replace impaired blood protein. Individuals with yellow fever must be kept away from mosquitoes in any area to prevent further transmission to others. Always protect yourself from mosquitoes. Keep arms and legs covered with long sleeves and pants. If the windows or doors of your house are left open, be sure that they have tight-fitting screens free of holes or tears. Always avoid unnecessary activity around mosquitoes. Use a mosquito skin repellent. Before vaccination, areas in sub-Saharan Africa and tropical Central and South America were most likely to contract the yellow fever virus. Vaccination is very effective for preventing the spread of yellow fever. Without the vaccine, yellow fever is a severe condition that results in death for 20-50% of individuals who contract it.